Outdoor Courses for Scrambling, Climbing, Kayaking & Mountain Activities: Into 2014 with Kendal Mountaineering Services. Into 2014 with Kendal Mountaineering Services. Sorry folks, we've not posted anything on the blog for ages! December & early January have been quiet as always in the run up to Christmas and due to people subsequently being "spent up" afterwards! However, bookings are looking positive for 2014 and we already have forward bookings as far as August - some of which have come about through development of our Gift Voucher which a good number of people bought as Christmas presents for family, friends and loved ones. We have done a little work though, Claire pictured right, booked a bespoke Navigation Skills Training day with Iain in December. As can be seen from the photo, the weather was bright & sunny if a little chilly, but ideal for a person wishing to brush up their map reading & navigation skills without having to work too hard in poor visibility. For Iain, it was a great opportunity to deliver a Skills Training Course somewhere completely different! This course was run on Wild Boar Fell almost on the border between Cumbria & North Yorkshire. Wild boar fell is an interesting place where the geological strata is a mixture of beds of limestone, Shale and Gritstone (known as the Yoredale Series to geologists). This produces features such as sinkholes, caves and escarpments - all useful features when you are looking for something to find on the map! Wild Boar Fell is also famous for Sand Tarn (photo two) nestling at the foot of the summit escarpment where there really is a sandy beach! We were fortunate not to see any wild boars though, in fact we did not see another person all day. 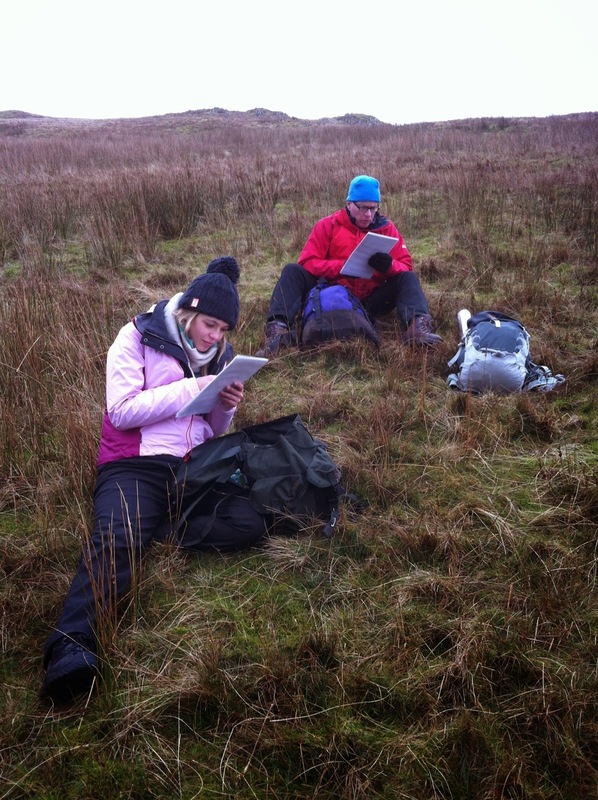 Claire gained a good foundation of Map Reading and Navigation Skills through her bespoke day out with Iain. These will certainly help her enjoy her future forays into the area's mountains, Good stuff! As we moved into the New Year, we were contacted by Tom McGregor. Tom is the son of one of Iain's friends from his time at Agricultural College in Lancashire in the 1980's. Tom was intending to visit The Lake District with his girlfriend Adela and was looking for things to do in the area and take opportunities to visit some of his Dads old friends in the process. 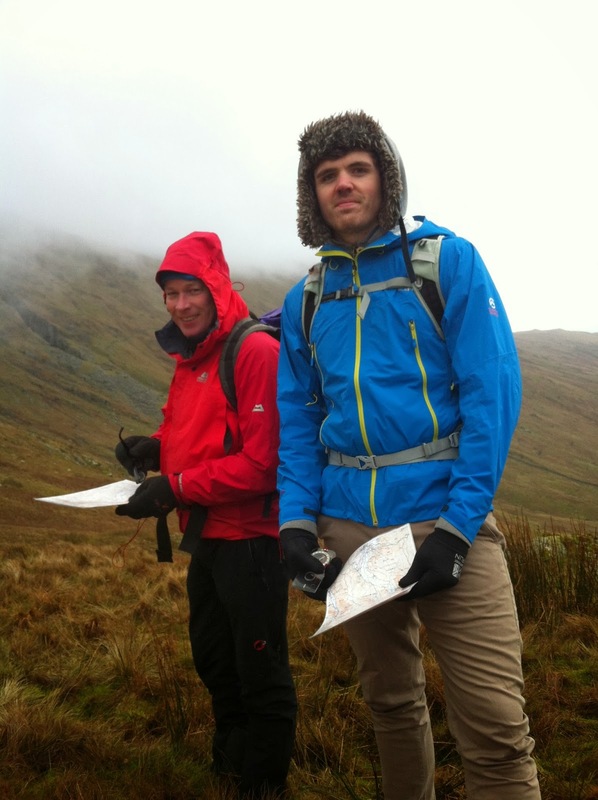 Iain arranged to meet the pair for a day out in the Kentmere area which is where we run most of our advertised Navigation Skills Training Courses. Both Tom & Adela were keen to do some hill walking and combine it with some Map Reading & Navigation tuition. As the day went on the cloud appeared to be lifting so we took a bearing for a hilltop near to the reservoir and then on to a massive rock called the Ull Stone which must be an erratic (a rock moved by glacial ice). Using the pacing and navigational skills already taught by Iain, the pair had no trouble in locating the Ull Stone. From there, we took a route directly to the top of Kentmere Pike so at least Tom & Adela were able to get at least one Lake District mountain top in during their visit. We then navigated successfully to a not easy to find spring before descending back to the car. Photo four shows Iain (red jacket) with Tom near to the Ull Stone. From Iain's perspective, it was nice to spend time with the son of an old friend whom he rarely sees. Tom & Adela were a lovely young couple and Iain's mate Robert must surely be very proud of this young mans achievements. Tom & Adela visited Iain & Kirstin in Kendal at the end of the following day - spent around Derwentwater & Keswick; they enjoyed an evening meal with us and were great company. We do look forward to seeing them again. For further details about our advertised Navigation Skills Training Courses in The Lake District, you can check out details of the courses here and can contact us here. At £80 per person for the advertised weekend courses, these really are exceptional value!